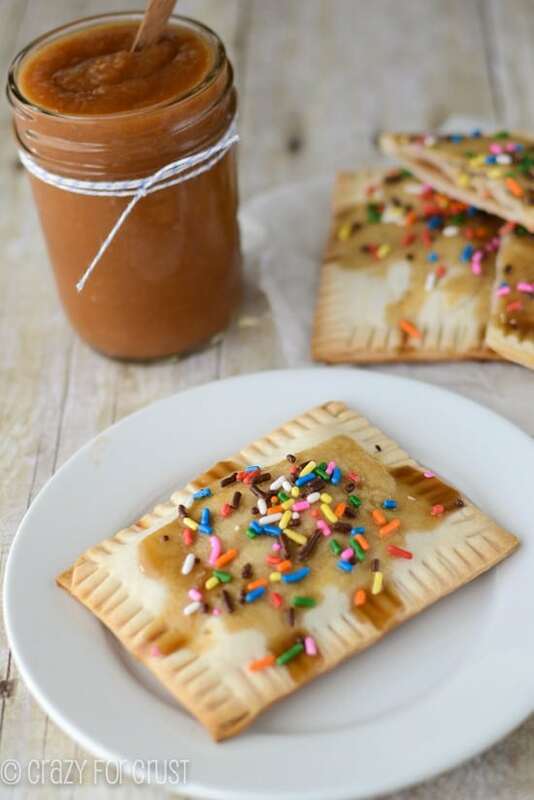 Applesauce Pop-Tarts are perfect for breakfast or a snack, and are even better when made with homemade crockpot applesauce! Last week I asked Jordan what she wanted for breakfast on the first day of school. I knew that, if it wasn’t cereal, I needed to make it ahead of time because really, mama is not a bake-muffins-in-the-morning kind of person. I was expecting to hear muffins! or cinnamon rolls! or pop-tarts! She asked for sprinkle pancakes. Really? I’m a food blogger. Give me some credit. It’s like when she asked for plain chocolate chip cookies. Anyway, I’ll comply with her. But I’m making these Applesauce Pop-Tarts for me. The idea for these all started when I was up to my ears in CrunchPak apples. I needed to use up a bag of them before they weren’t good anymore so I decided to make applesauce. I love making homemade applesauce because it makes your house smell amazing, and like Fall. Have you ever made applesauce in the crockpot? It’s one of my favorite things to do in the slow cooker, and we do it every year. You simply add you apples to your slow cooker and cover them with water, sugar, and cinnamon. Let them cook all day until they’re soft, and your house smells amazing! Once the apples are soft enough, you mash them into applesauce. I like my applesauce totally smooth – I’m not a “chunk” person – so I use a hand blender to puree the soft apples. But you can also mash them with a potato masher if you like chunkier applesauce. Once the applesauce is made, you can eat it for dessert, pour it over ice cream, or give it as a gift! 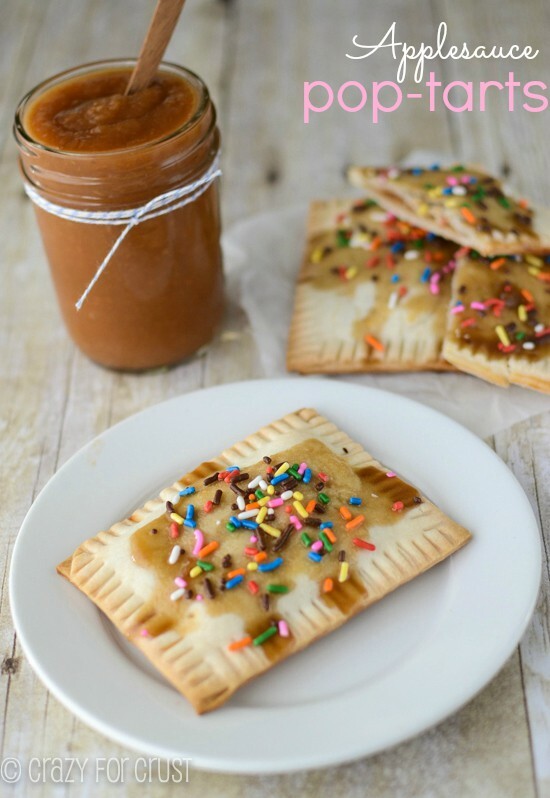 Or…you can make pop-tarts, which is my favorite way to use homemade applesauce! Of course, if you don’t want to go through the step of making your own applesauce you can use store bought. I won’t tell, I promise. 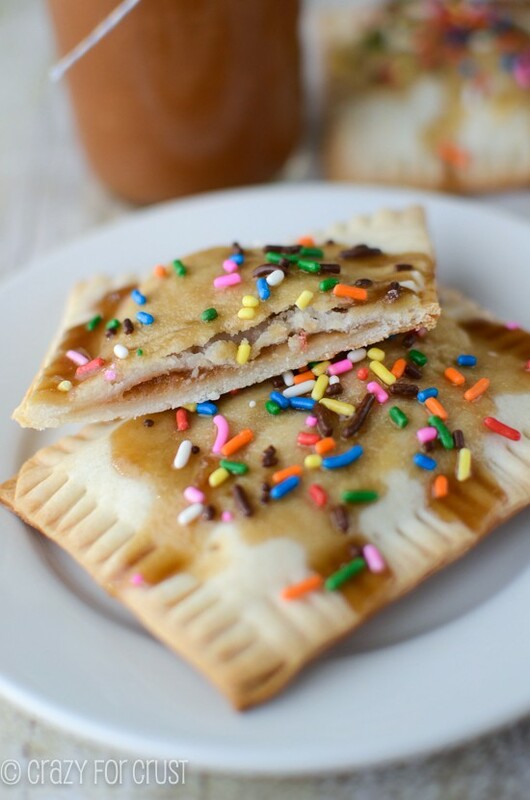 These pop-tarts are so easy to make. 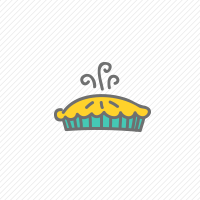 They start with Pillsbury refrigerated pie crusts. 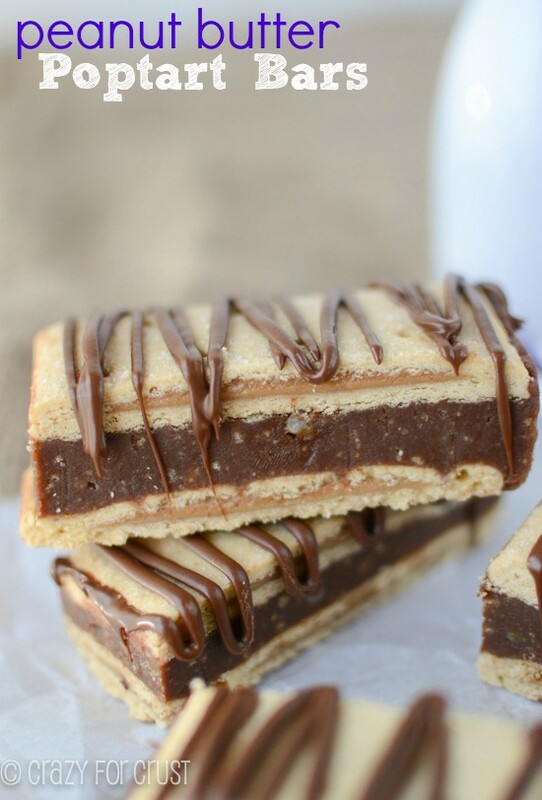 Once you cut them into rectangles, you fill them with applesauce and bake them up. I drizzled mine with a brown sugar icing, because brown sugar makes everything better. And sprinkles. You can’t ever forget the sprinkles! Pop-Tarts for breakfast and crockpot applesauce for dessert. Or the other way around. Whatever, it just sounds like a good day to me! Applesauce can be stored in a tupperware in the refrigerator for several days, or frozen for future use. Unroll one pie crust. Use a rolling pin to roll the circle into more of a rectangle shape. Use a knife to cut off the rounded edges, to give you an exact rectangle. Cut the rectangle into six equal rectangles, to form the pop-tart crust. Reserve the edges you cut off. Repeat with second crust, and re-roll the edges to get 2-4 more rectangles. Lay out your crust rectangles on a flat surface. Place 1 tablespoon of applesauce in the center of half of them. Whisk egg in a small bowl. Use your finger and trace the edges of each of the rectangles containing applesauce with a bit of egg, to help in sealing the pop-tart. Cover the applesauce rectangles with a plain one and seal the edges together with the tines of a fork. Place pop-tarts on a cookie sheet lined with parchment or a silpat. Poke each pop-tart with a fork a few times so that air can escape while baking, so they don’t exapnd. Bake for about 13-15 minutes, until golden brown. Cool. Make the frosting by whisking together the brown sugar, corn syrup, vanilla, and milk. Spoon over the pop-tarts and sprinkle with sprinkles. Pop-tarts can be reheated in the microwave or frozen for later eating. Do not toast frosted pop-tarts. You can omit the frosting if you want to toast them to reheat. Thank you for sharing such a brilliantly simple and tasty idea. 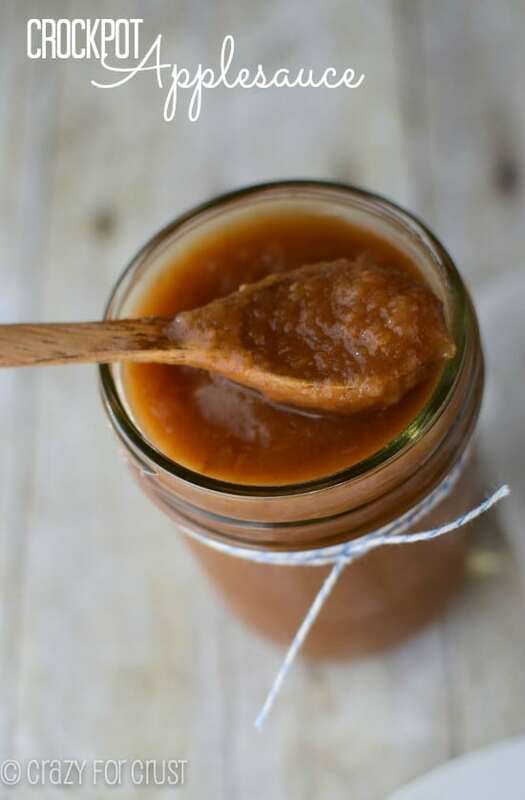 I pinned this recipe a few months ago but a big pot of homemade applesauce never lasts long enough around here for me to try it. I stashed a dish-full in the bottom of the fridge this time so I could finally make them. Yummy!! a big hit for everyone and I was even asked when I would make them again. Yay! Thanks for telling me Michelle. I’m so glad! 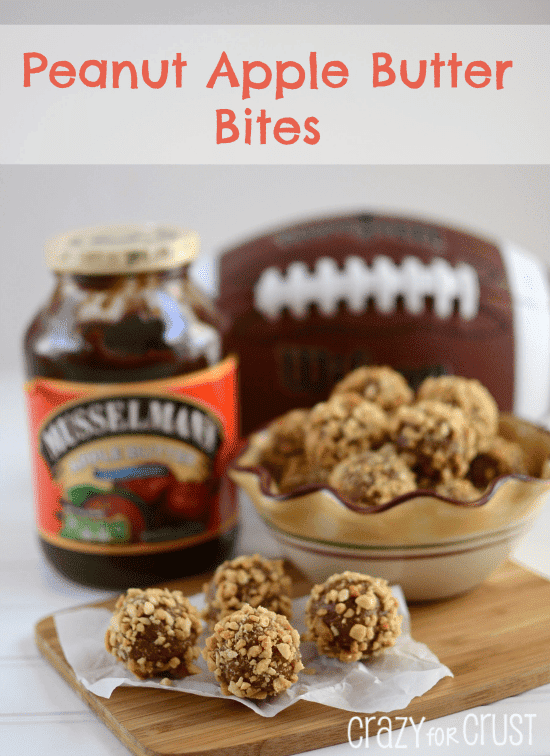 I’d like to make a post of my own about making these lovely morsels and credit you and this post for the recipe and my inspiration. Is that ok with you? That’s great Michelle! As long as, if you share the recipe, you write the instructions in your own words (or make changes to it, even better) and link back. And if you share one of my photos, please don’t share the recipe. Thank you! These look great! Can you make the pop tarts without the corn syrup? Also, you say not to reheat in the toaster, but would a toaster oven be ok?? Thanks!! The corn syrup is just for the glaze, so I think so, yes. But it might not harden as much. You may want to just make a simple powdered sugar glaze (powdered sugar, some vanilla extract, and heavy whipping cream or milk – just enough to get the desired consistency) instead!